Biofuelwatch offers information support to national and local organisations campaigning – or considering campaigning against – destructive biomass projects in the in the UK and in any EU member states. 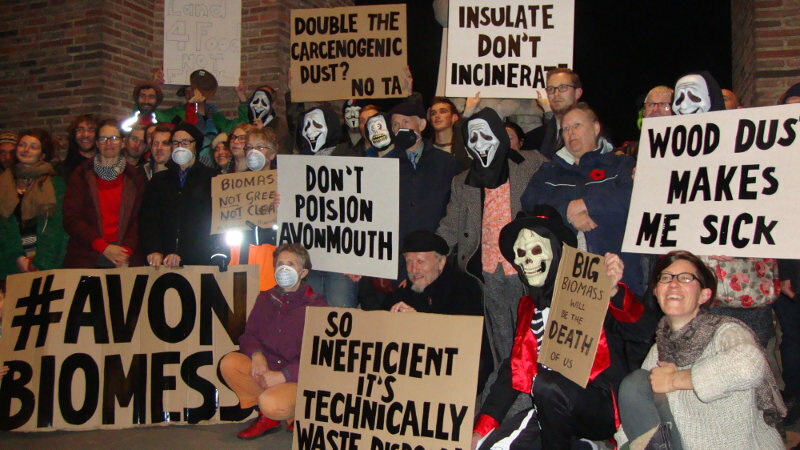 In the UK, we have been supporting local campaigns against biofuel and biomass power stations since 2008, several of which have had a successful outcome. We are now offering the same support to groups elsewhere in the EU. We can help with information about the impacts of specific power stations and related infrastructure (such as pellet plants). We may be able to offer support with building local campaigns, networking between different local groups with a range of experiences, with information about relevant UK or EU-wide regulations (e.g. Air Quality or Environmental Impact Assessment regulations). If there’s a biomass or biofuel (bioliquid) power plant proposed or one has been built near where you live – whether you’re in the UK or elsewhere in the EU – and you’d like to know more, please email us: biofuelwatch@gmail.com. If you’re based in a European country that’s not in the EU, we’d still be happy to see if we can support you – but wouldn’t know about relevant legislation. Please see here for details of some of the local and national campaigns against biomass developments which we are currently supporting. See here for maps of proposed, operating and rejected/closed biomass and biofuel power plants and biomass gasifiers and pyrolysis plants in the UK. Please let us know if you’re aware of one we’ve missed!